Here's a ghost toy I painted today. She's made of sewn muslin, with a few coats of gesso (sanded in between each coat), and acrylic craft paints for that lovely matte look. I LOVED doing this. I'm planning on doing more. The Big Toy is long-term, which is hard for me. So although I continue to knit and knit the Big Toy at night, watching various police procedural TV programs as I do so, I want to take a moment here and there to do these smaller pieces. I guess I like instant gratification (which in my weird world means spending 6 hours on a project rather than 30!). 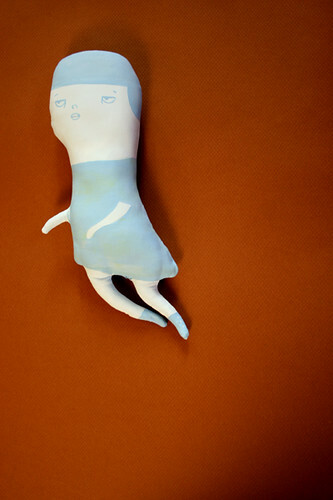 wow, I really this doll- painting on muslin could open up a whole new direction. Exciting! i love love love ghost doll. I really enjoy the way this turned out. She is almost ephemeral, despite being quite opaque! SHE IS STUNNING!!! i love her! She is absolutely wonderful! The colors and shape are perfect. Craft on, Jess Hutch, craft on!